Parasitic nematode worms are the `hidden enemy’ of farmers world-wide, causing billions of pounds worth of crop damage every year. 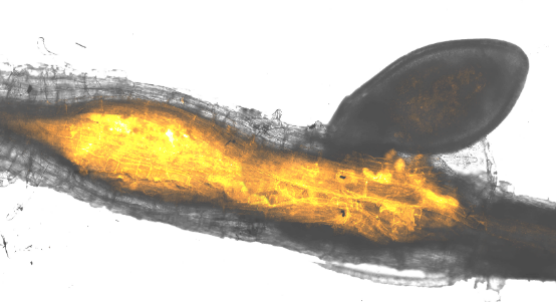 Now an international research collaboration led by the University of Dundee and the James Hutton Institute has detailed the genome sequence and inner workings of the yellow potato cyst nematode (PCN), giving scientists new insights into how it can be stopped. “This is an exciting discovery which reveals the potato cyst nematode’s ‘parasitism toolkit’,” said Dr Sebastian Eves-van den Akker, of the University of Dundee’s Division of Plant Sciences, based at the James Hutton Institute. “Once we had sequenced the genome of the nematode, we uncovered a hidden genetic code, or signpost, that points towards the molecular tools the nematode uses against plants. We believe this genetic code is actually how the nematode categorises which genes it needs when infecting plants so, in a way, we can use their own signpost against them. Potato cyst nematodes are devastating to crops and are exceptionally hardy: once established in a field, PCN are effectively impossible to eradicate in the short term, and because they persist as long-lived cysts in soils, growing potatoes may not be economically viable for up to two decades. The US Department of Agriculture (USDA) has classified the yellow PCN as potentially more dangerous than any insect or disease affecting the potato industry. Substantial effort is already invested into keeping land free of PCN; both species are present on USDA and European Plant Protection Organisation quarantine organism lists. All major crops are thought to be infected by at least one species of plant-parasitic nematode, which cause damage valued at over $80 billion each year. Now researchers have found the toolkit for the potato cyst nematodes, the aim is to carry out similar analyses in other nematodes. There are currently very few pesticides available which can deal with a nematode infection, as most of them have been withdrawn for various reasons. So there is a pressing need to find new ways to prevent crop infection, particularly given the increasing importance of potato as a major food staple around the world, including in China. The vast majority of plant-parasitic nematodes feed on plant roots, meanwhile `injecting’ the plant with a variety of destructive proteins and plant-hormones. “If we can target these areas of the nematode’s activity then we will be better able to stop it,” said Dr Eves-van den Akker. The international collaboration has been led by award-winning researchers at the University of Dundee and JHI and involved scientists from the Universities of Edinburgh, Leeds, Hull and St Andrews in the UK, Wageningen University (Netherlands), Aix-Marseille University (France), King Abdulaziz University (Saudi Arabia), Institut National de la Research (France), Wellcome Trust Sanger Institute, IGEPP (Institute for Genetics, Environment and Plant Protection) (France), Agriculture and Agri-food Canada, the Canadian Food Inspection Agency (CFIA) and the USDA-ARS Horticultural Crops Research Laboratory. With more than 900 scientists, research students and support staff from 61 countries and external funding in excess of £50 million per annum, the School of Life Sciences at the University of Dundee is one of the largest and most productive Life Sciences research institutes in Europe. The Division of Plant Sciences at Dundee is an internationally recognised centre for molecular plant science. The James Hutton Institute is a world-leading, multi-site scientific organisation encompassing a distinctive range of integrated strengths in land, crop, waters, environmental and socio-economic science. From its sites in Scotland, it undertakes research for the Scottish and UK governments, the EU and other organisations worldwide. The Institute has a staff of nearly 550 and 125 Ph.D. students and takes its name from the 18th-century Scottish Enlightenment scientist, James Hutton, who is widely regarded as the founder of geology and who was also an experimental farmer and agronomist.